Emily Vork is a sophomore from Ojai, California triple-majoring in History, Religious Studies, and American Studies. Her hobbies include eating and reading Internet comments. It quickly became clear to me that the field of Religious Studies is not really all that well-known or well-understood. Religious Studies is not Theology, nor is it a field full of classes like “Why God Doesn’t Exist” or “Everyone Should Be Buddhist”. Religious Studies, surprisingly, doesn’t really have all that much to do with religion in the way people think of it—or, maybe, it has everything to do with exactly that. In Religious Studies, we question what it means to be religious. There is no one definition of religion. So if “religion” is Christianity, Islam, or Shintoism, then there are some classes on those. If “religion” is the behavior and rituals of a group of people, then there are classes on that, too. A “religion” can be a group of people singing hymns on a Sunday morning in a church, or it can be a group of people singing a fight song on a Saturday night in a stadium. Where’s the line between these activities? Answering that question isn’t really our job as scholars of Religious Studies. Instead of drawing the lines, we look at what lines have already been drawn. Who drew these lines and why did they put them where they did? While I don’t have all the answers—give me a break; I’m only a sophomore—I can certainly say that I am a better student for having thought about the questions. When I took the Introduction to Religious Studies course my first semester, I didn’t just think about these questions—I realized that they existed. That realization has been one of the best things to happen to me as far as my academics are concerned. I’ve applied the knowledge that I learned in just one Religious Studies class to courses in History and American Studies, my other two majors. I wish that every student—Humanities, Social Sciences, Engineering, anything—would take that introductory class. They’d be better for it, and, subsequently, so would everyone else, since eventually we the students will be the ones in charge. But every student probably won’t take that course. 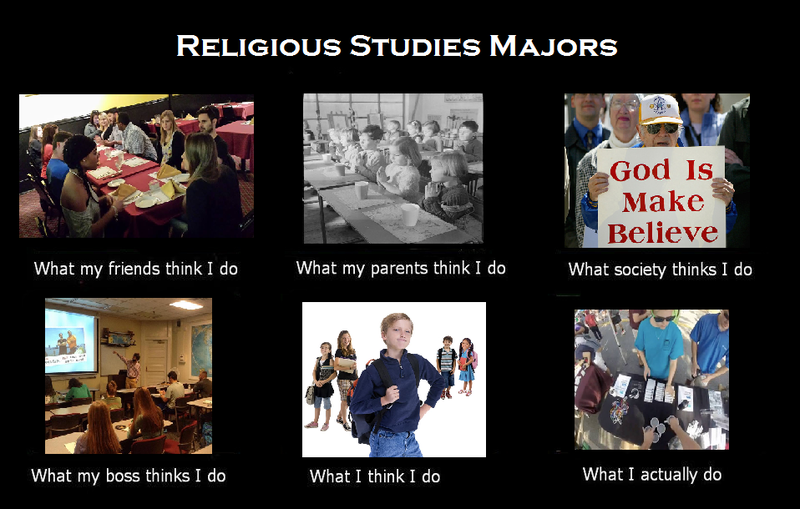 A lot of students don’t even know what Religious Studies is, and those who’ve heard of it likely think that it’s for kids who want to go to seminary. The department’s tagline is “Studying Religion in Culture,” and that’s really the best summary of Religious Studies there is. The real confusion, then, comes from what it is that we mean by “religion”—and as long as that question remains, our professors still have jobs. This entry was posted in Relevance of Humanities, Religion in Culture, Student Blog and tagged Defining religion, Emily Vork, Religious Studies, Theology by admin. Bookmark the permalink.